NEW YORK—Richard Wagner’s “Die Meistersinger von Nürnberg” clocks in at almost six hours, which may be too much of a good thing. Or maybe not. 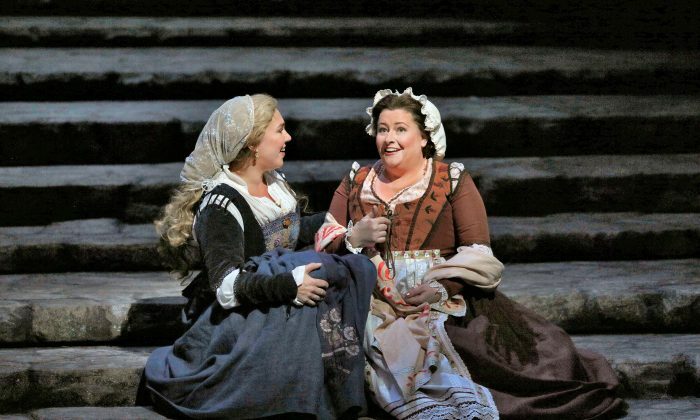 The Metropolitan Opera’s revival has undeniable charm, some laughs and stirring sections, starting with the overture beautifully played by the orchestra under the baton of James Levine. This is the Otto Schenk production from 1993, with sets by Günther Schneider-Siemssen, costumes by Rolf Langenfass, and lighting by Gil Wechsler. The remaining performances this month will be the final ones for this production. It’s old-fashioned in the best sense, not overly extravagant but carefully evoking the time and place of the opera. The audience applauded several times when the curtain went up. Wagner wrote the libretto for the opera, and the plot is like “American Idol” transplanted to Germany in the 16th century with a romance thrown in, as well as some philosophizing about art. The contestants have to both write a song and perform it. Walther’s rival, both romantically and musically, is the town clerk Sextus Beckmesser. The latter judges Walther’s trial song and, in the manner of Simon Cowell, gives him a thumbs-down. When Sachs learns of the mutual attraction between Eva and Walther, he decides to help the young lovers. In a funny scene, he frustrates the efforts of Beckmesser to serenade Eva. Moreover, the woman the clerk is singing to turns out to be Eva’s friend Magdalene, arousing the anger of her suitor, David, who happens to be Sachs’s apprentice. The next day, Walther shows up at Sachs’s workshop, and the cobbler helps the knight fashion his poem into a finished song. When they aren’t looking, Beckmesser appears and steals the piece of paper with the song. At the contest, Beckmesser makes a fool of himself, garbling the words of the song so that they come out as nonsense. Walther delivers the finished piece and wins the competition. At first, he inexplicably turns down the masters’ necklace, but Sachs convinces him to accept it. Thus, the hero gets the prize and Eva. 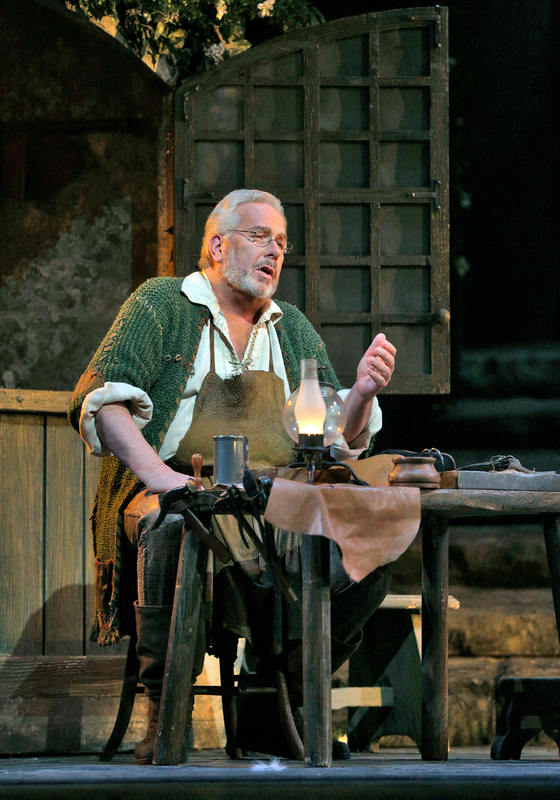 The role of Sachs is a complex and demanding one, and bass-baritone James Morris delivers a powerful performance. If his voice has lost some of its luster, he more than compensates with his multifaceted interpretation of the character. As Walther, tenor Johan Botha impresses with his clarion sound and smooth delivery. His “Prize Song” was certainly among the musical highlights of the evening along with Sachs’s monologues “Was duftet doch der Flieder” and “Wahn! Wahn! Überall Wahn!” Botha is not much in the way of an actor, but his singing is always a pleasure. The soprano Annette Dasch looks and sounds right as Eva and so does the bass Hans-Peter König as her father, Pogner. The German baritone Johannes Martin Kränzle is simply wonderful as Beckmesser, the comic heavy, who is humiliated in the end, a sort of Malvolio figure. Also noteworthy in the large cast is the other set of lovers, mezzo-soprano Karen Cargill as Magdalene and tenor Paul Appleby as David. The chorus and orchestra maintain their consistently high standards, and the presence of James Levine is always a cherished event. The Live HD broadcast with Volle as Sachs will take place at local theaters in the U.S. on Dec. 13 at 12 p.m. ET, and there will be an encore on Wednesday, Dec. 17, at 6:30 p.m. local time. Jarmila Novotná (1907–1994) was an opera star for 30 years, but she may be best known today for her non-singing roles in two Hollywood films. This production of “The Threepenny Opera” makes for a valiant effort but ultimately fails.